repeat prescription ordered as well as any added extras you might need over the Festive period. It is this time of year your routine gets thrown out of whack. I find my repeat prescription is done every 2 months but normally at the start of the month…so come Christmastime and New Year I need to think ahead. Working how much i have of everything and see whether or not I can wait till the first week in Jan or do I need to get it all before Christmas and have loads of stuff as will have two weeks extra of everything. 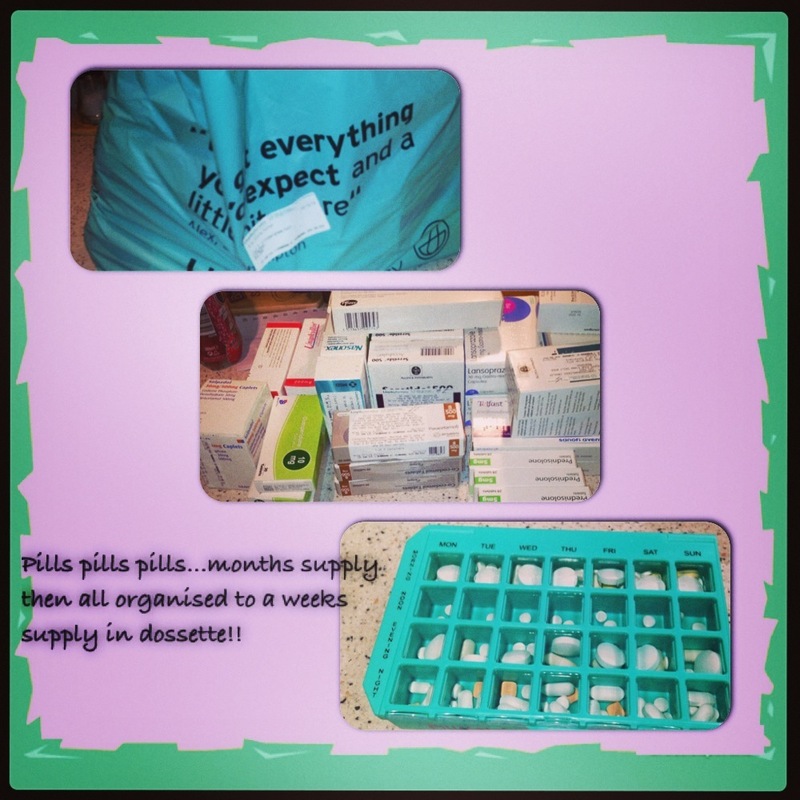 This doesn’t sound like much but when most of your medication comes in different boxes and one box tends to last 2 weeks you have a lot more medication to store. Rather than being caught short and giving the poor pharmacist a rush in the New Year I have put in my repeat early to make sure I have everything I should need to keep me running until the start of March!!! We are not even in the 2015 and I am already thinking ahead to March. Over the Christmas period I have also asked of extra anti biotics and extra prednisilone to have as a wee stockpile should I fall ill over Xmas. I would much prefer to just start them myself than have to go through NHS 24 who tend to just send me to hospital the moment they hear Brittle asthma and struggling to breathe even if it is just an infection and not an attack they do tend to panic. So having supplies at home is so much easier. It is also reassuring knowing you have them. With so many people coming and going, family round and a whole heap of germs and bugs you never know what you may get. This is one of the really bad sides of prednisilone- you become susceptible to anything and everything. As well as catching things, trying to the row them off is even harder. I think my family think I am a bit OTT about not going round when someone has a cold but it is easy for a healthy person with no png problems to pick up a cold and suffer how do you think I feel because it always goes to chest no matter how quick i catch it and start increasing treatment. Its just one of those things. I am now prepared for Christmas and New Year. Just a few odds and ends to get and thats it!! Taking action- when, what and why? ?